"businessman plans to rescue the abandoned format"
"If all goes to plan, the Polaroid factory in Enschede, Amsterdam, will soon be making film again thanks to its new owner, an eccentric Austrian artist and businessman named Florian Kaps. 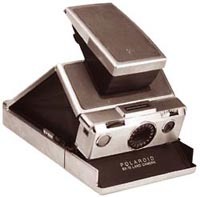 ...Dubbed "The Impossible Project", the development of new film for Polaroid cameras launches today. Working with the Manchester-based black and white photography company Ilford, the machinery is in place to produce film of two exposure types, each compatible with both the classic SX-70 cameras popular with artists and the more modern 600 series." I love using my SX-70 Land Camera. A real beauty, the SX-70. May be you like this vintage ad, too: 1975 Polaroid advertising (USA).